Hello Sweet Friends! 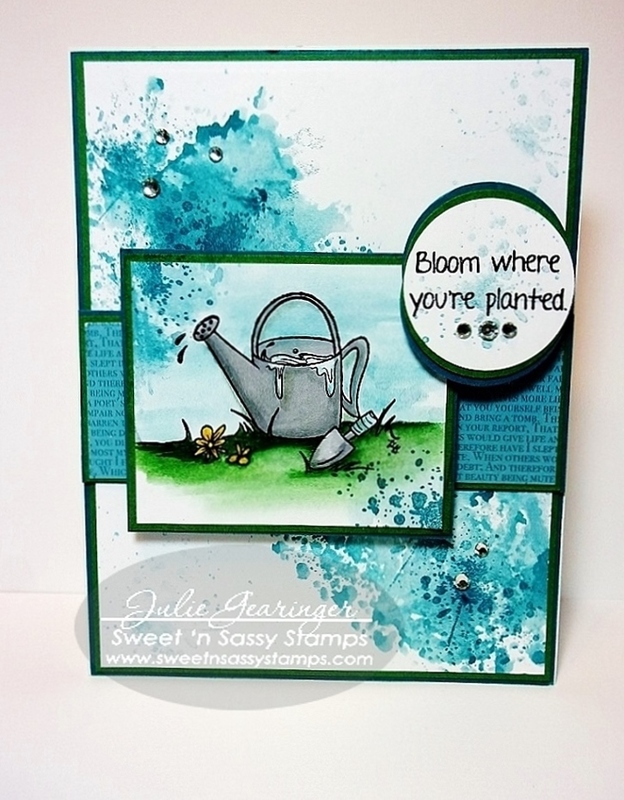 Julie here to share a card created with the brand new stamp set, Winnie’s Garden (designed by Wynne Gettelfinger) along with Grunge Elements and a fun Smakin’ Acetate technique (an “older” technique but still fun:-)). To create the background with the Smakin’ Acetate technique: I used a clear acetate envelope (like the ones used for the packaging of the Sweet ‘n Sassy Stamp Sets), cut one side of the envelope and the bottom so that the envelope would open like a “book”, opened the envelope and gently patted the blue water-based ink onto the acetate, spritzed it with just a bit of water, closed the envelope over the ink, smooshed the ink with my fingers through the acetate, re-opened the envelope, inserted the piece of white cardstock and pressed into the ink. Whew!! Sounds like a lot of steps but really it is quick and I love how each background turns out a bit different. Once I finished the background, I used the Grunge Elements splatter stamp with same blue ink to add a few splatters, trimmed the panel and mounted it onto green cardstock, trimmed once more and mounted onto the coordinating blue cardstock. I inked the cute watering can image from Winnie’s Garden with archival black ink, stamped onto white cardstock and used a watercolor brush with ink from the coordinating ink pads to color the image (along with two shades of gray alcohol markers for the watering can and trowel and a bright yellow marker for the flowers). Once it was punched out, I added the Grunge Elements splatter with the same blue ink (stamp off before stamping onto the background of the sentiment) and mounted it onto the green and blue cardstock. Everything was layered with dimensional foam and I added the rhinestones for the finishing touches. I hope you enjoyed this fairly quick and easy card. 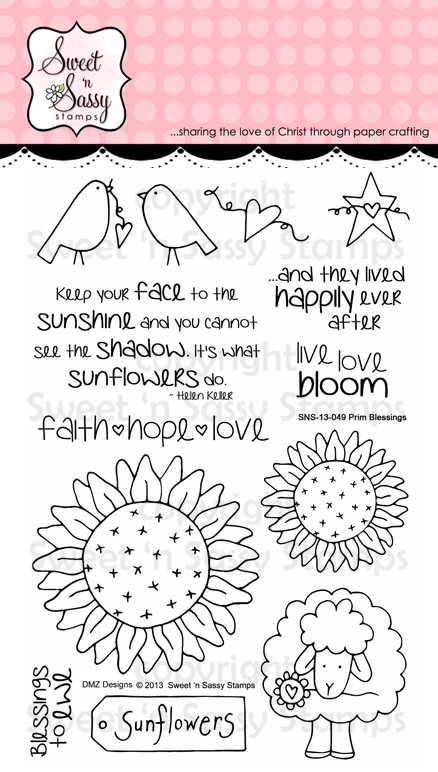 I just love the cute images in Winnie's Garden and know that you will have fun with this stamp set for sure!! 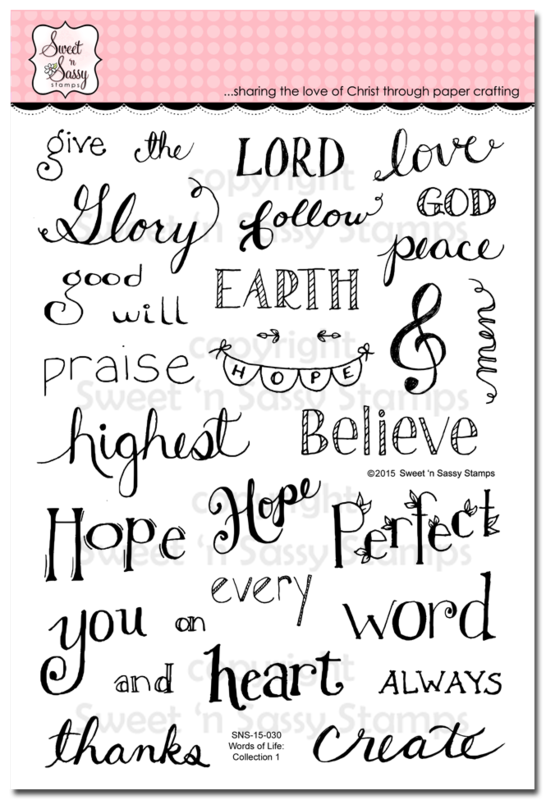 Hugs and have a blessed week, sweet friends! Good morning! 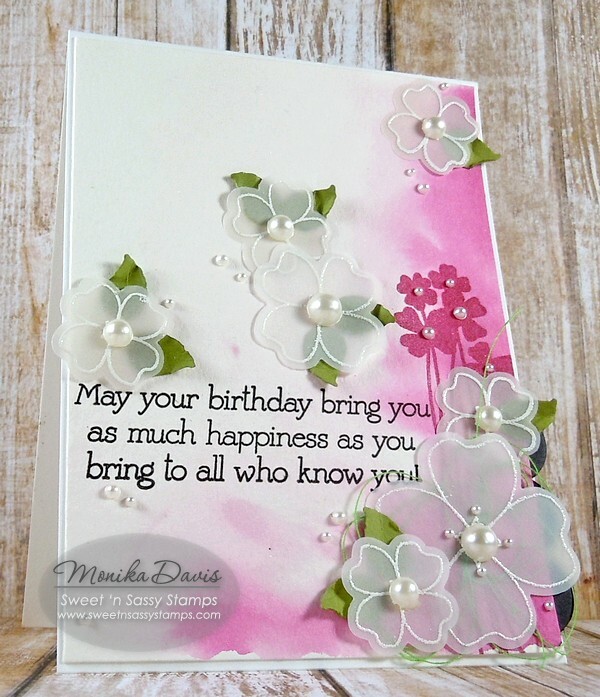 Today I am sharing a card using one of my favorite sets, Parisian Postcard, along with the Sympathy Innies. 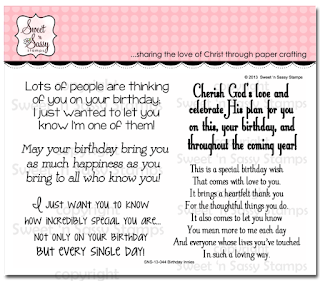 I think if you ask any card maker what their least favorite card to make was, sympathy cards would come to mind. But unfortunately we all need them so sometimes I like to go monochromatic for a quick and easy way to create a beautiful, yet heartfelt card. I die cut my card base and layers, then stamped the images first and second generation (stamping off once). 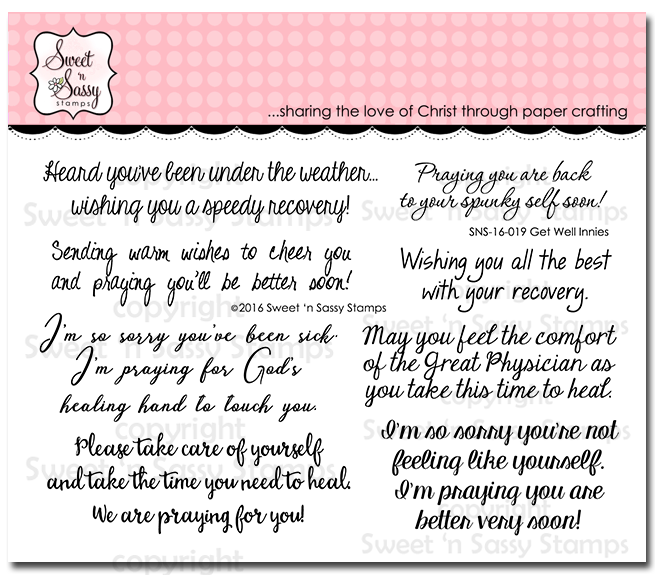 I hope you don't need to make a sympathy card soon, but if you do then I hope I've given some inspiration. If possible, I like to make them when I don't need them and keep one or two on hand. over you with loud singing." How sweet is that? 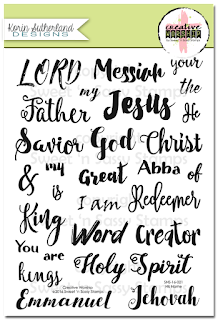 Our Father sings over us? Like the song (How Sweet the Sound by Citizen Way) says...."how sweet the sound...I hear you singing over me...I once was lost, but now I'm found...and, it's a beautiful sound!" The Word and song together created, for me, a remembrance of sing with, to and over my own children. I couldn't resist adding the sweet silhouetted images from Happy Together. Just picture it--it's how He sees us! I tried my hand at some lettering....need more practice! And, also added color with distress inks and the watercolor smoosh technique--not sure if that is an actual technique name or not. I added inks to my nonstick kraft sheet, spritzed with water and dipped the pages. It's definitely something you need to have an open mind about as it's hard to control for a specific outcome. 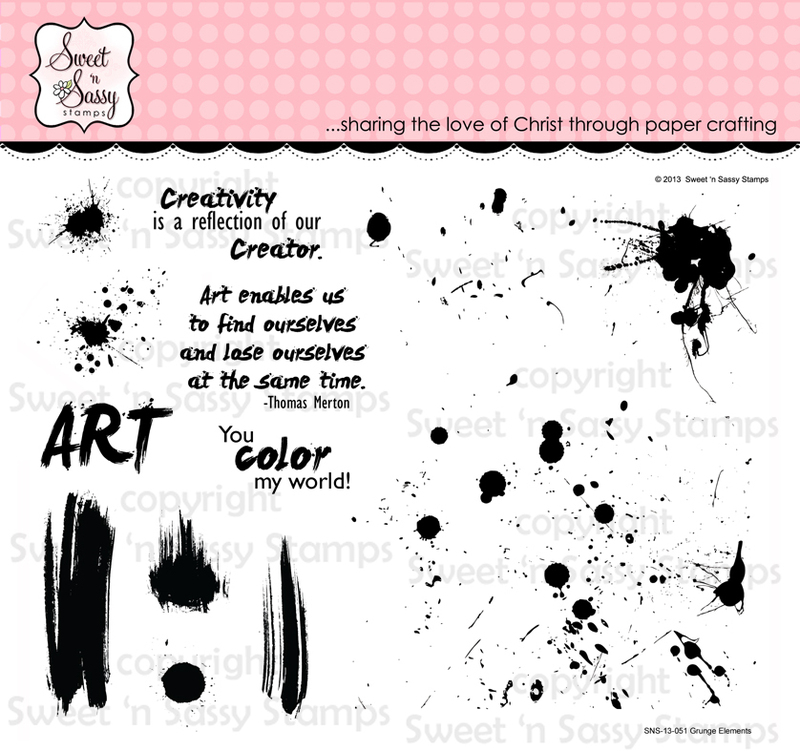 I used several other Sweet N Sassy sets to complete the layout: Borders and Backgrounds, Words of Life-Collection 1, Choose Faith and Note This. I wanted to make something fast, but add an easy technique... hence the heat embossing. 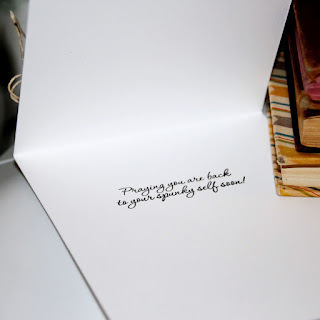 The raised surface always gives an extra touch to any cards. 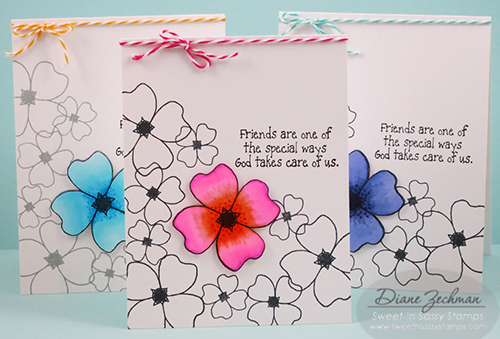 The main images were stamped with VersaMark and heat embossed with white embossing powder... then they were water colored, along with the background. 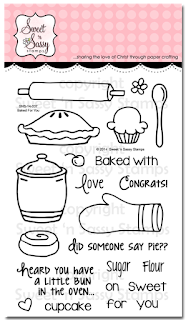 I also used Get Well Innies clear stamp set. 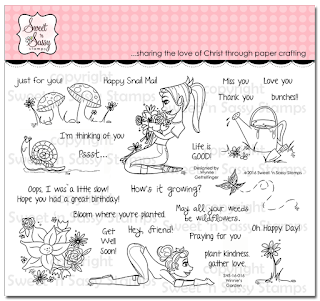 Happy Saturday, Sweet 'n Sassy Stampers! It's Ceal, here to share a card usage one of our newest sets Happy Together. 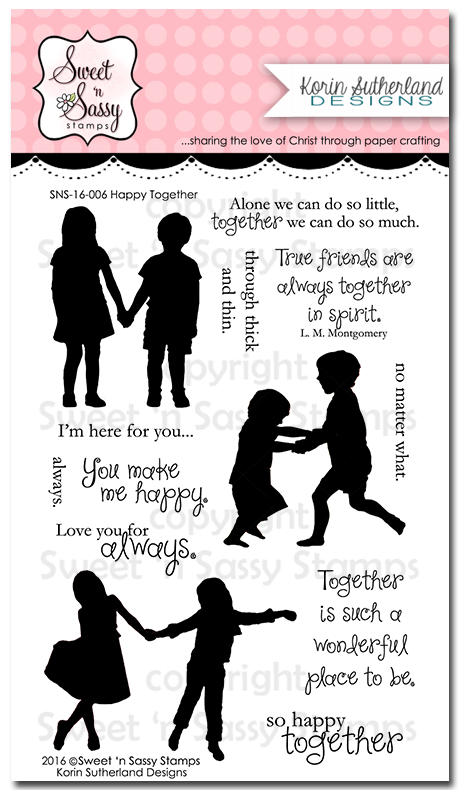 This set is super sweet, it has three adorable silhouette images along with some great sentiments. 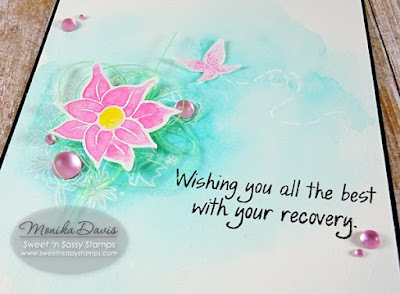 To make my card I stamped the image using Versafine Onyx black ink and then did a watercolor wash over it. I paired it up with some super cute plaid paper and the sentiment to finish it. 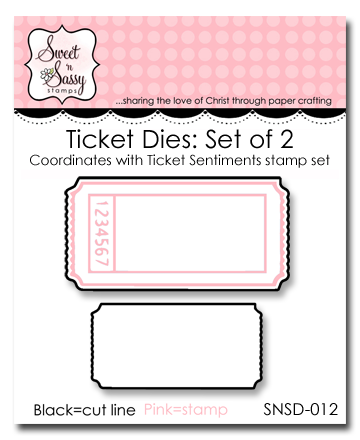 This set is also a great set for Bible Journaling and also for wedding, engagement and save the date cards. Hello Sweet 'n Sassy Friends…happy Friday! 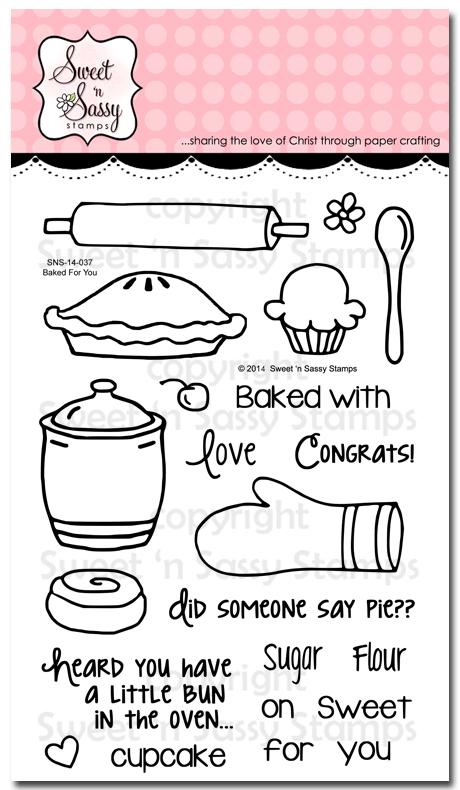 Have you had a chance to see the new stamp sets added to the Sweet 'n Sassy Stamps Store? 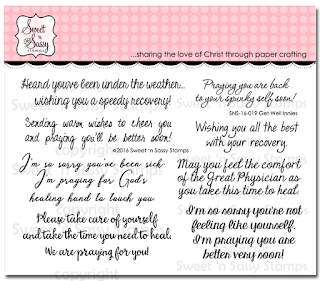 If you love our innies, you will want to add Get Well Innies to your collection. 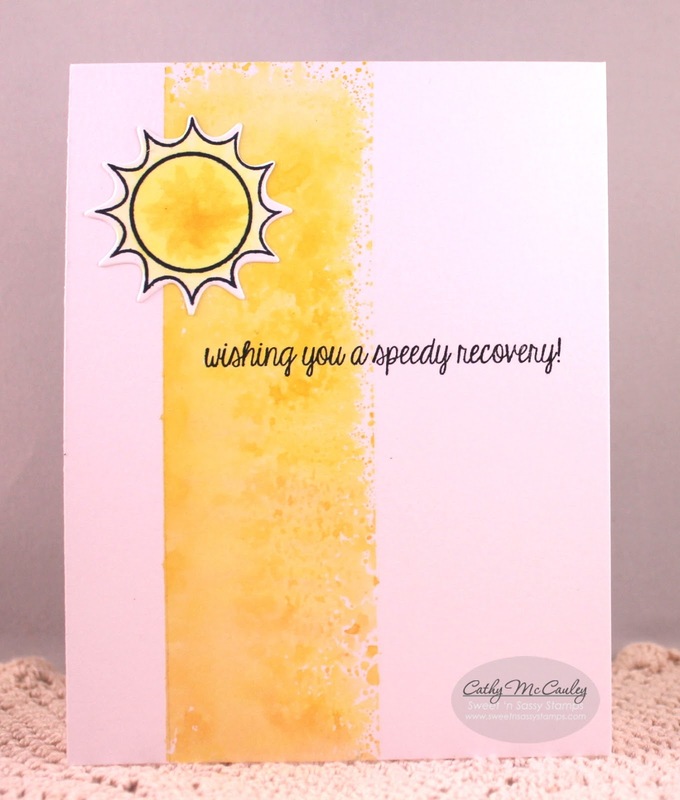 They are perfect for sending a little bit of sunshine to someone who is feeling under the weather. 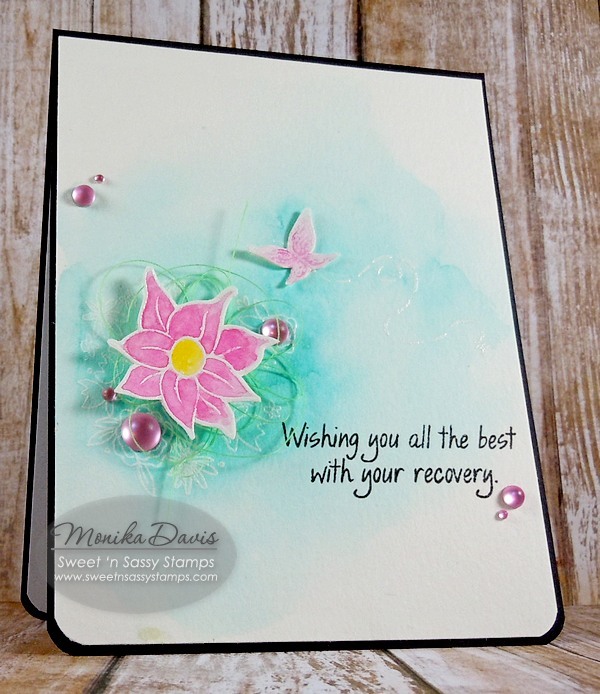 When you pair the Get Well Innies with the new Happy Together stamp set, you have a winning combination! …you see the other part of the sentiment and the sun from Wish You Were Here. 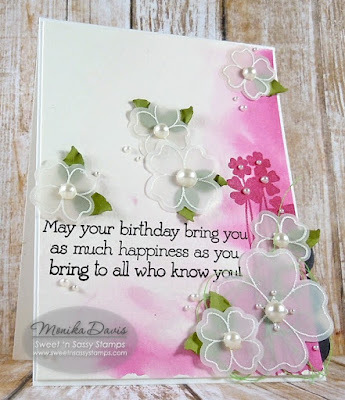 In case you missed it, here is another card made with the Happy Together stamp set and Nature Silhouettes 2. You can pick up these delightful new stamp sets any time at the Sweet 'n Sassy Stamps Store as well as the new His Name stamp set added to the Creative Worship line. 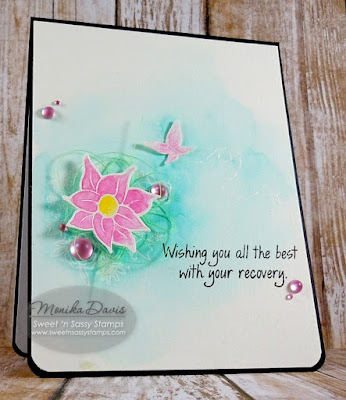 Get Well Innies is one of two brand new stamp set we have in the store. 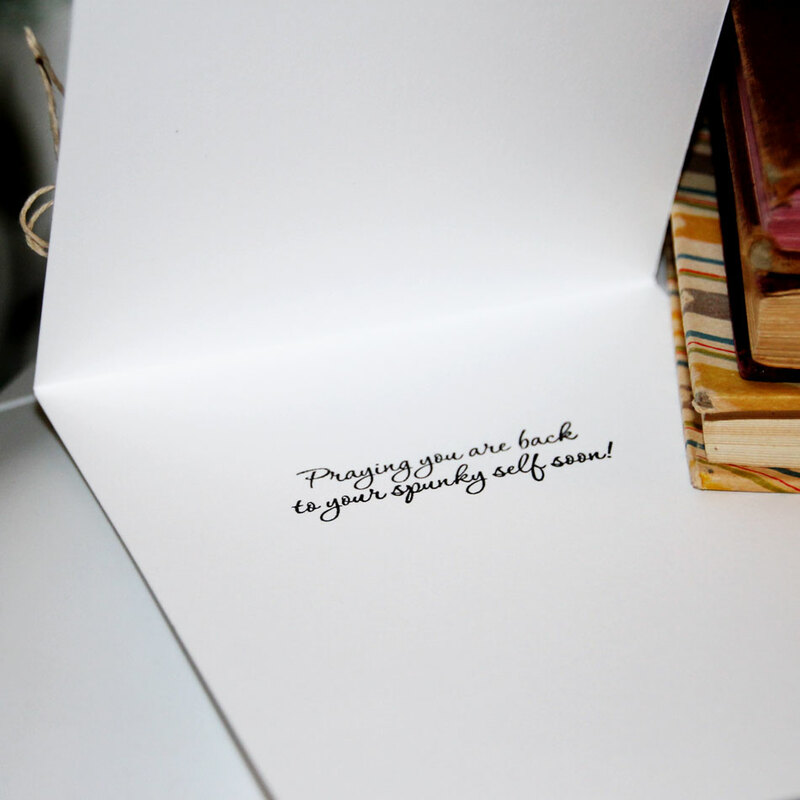 It has lots of sweet sentiments. I used one on the front of my card and one on the inside too. 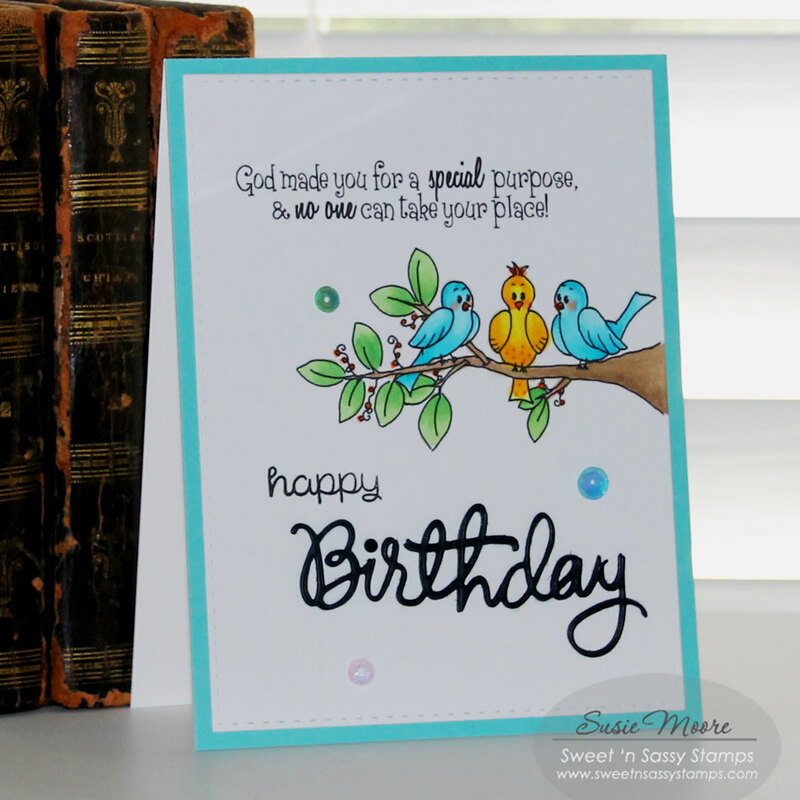 I used two other stamp sets to make my card - Prim Blessings and Baked for You. 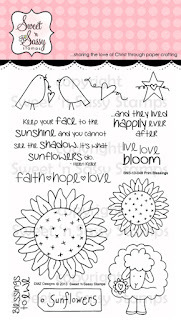 The sunflowers are from Prim Blessings and the little flower accents are from Baked for You. 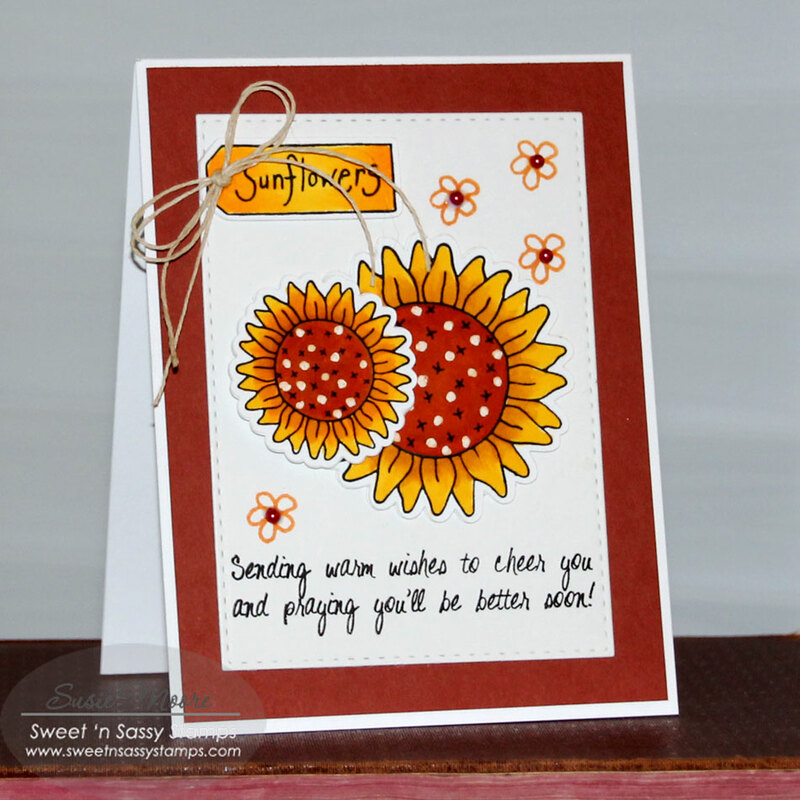 I die cut and colored my sunflower images and built my card from there. The Get Well Innies worked perfectly on this particular card layout. Have a great day and we'll be back very soon with another post. Hello Sweet Friends! 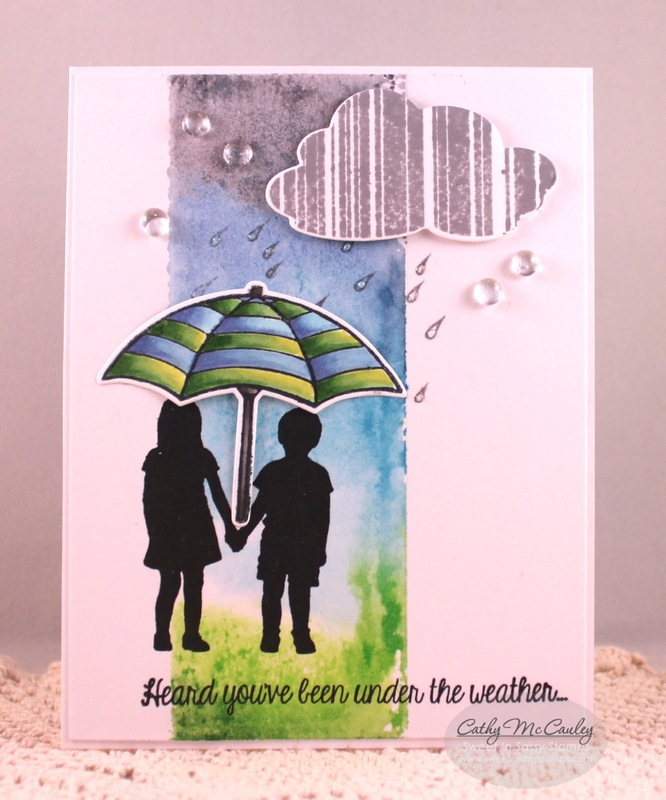 Julie here to share a card created with the new stamp set, Happy Together (designed by Korin Sutherland) along with Grunge Elements and the Ticket Dies. 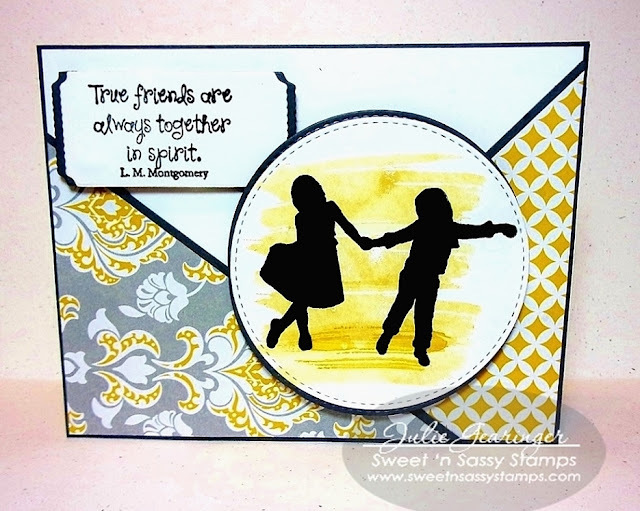 First I stamped the Grunge Elements stamp with yellow ink onto white cardstock and then stamped the figures from Happy Together with a dark gray ink. The sentiment (also from HappyTogether) was stamped with a dark gray ink onto white cardstock, die cut with the largest of the Ticket Dies and mounted onto another die cut from dark gray cardstock (the dark gray die cut was split in half before adhering the sentiment layer so you could see the edges peek out on the sides). 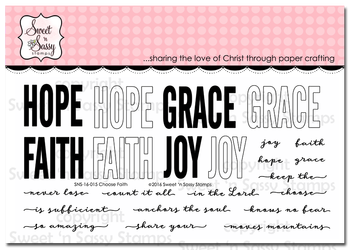 I just love the images in this new Happy Together stamp set, don't you? 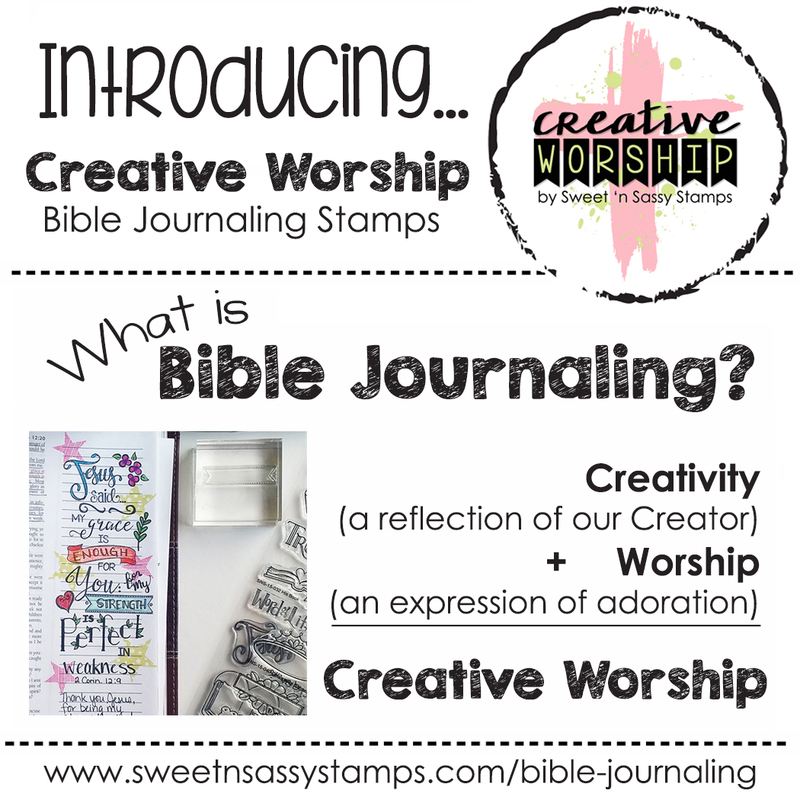 I think it will be great for so many occasions as well as Bible Art Journaling. 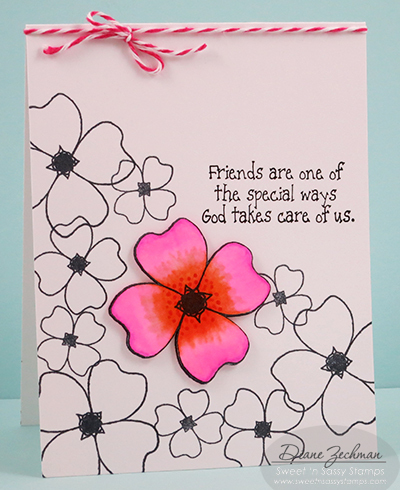 I hope you enjoyed this quick and easy card :-) Hugs and have a blessed week, sweet friends! Today is another beautiful day the Lord has given us. Did you mess up yesterday? Well, the slate is clean and you get to try again today. His mercies are new every morning! First up is a fabulous new set for our main line of stamps called Happy Together. We know how much you love our silhouettes so this one about friendship will surely make your heart happy. Both sets are now available for preorder (but shipping next week, so the wait won't be long). Don't forget we offer FREE shipping with your $75 order AND you'll receive $5 in SNS Cash Rewards (as a store credit) for every $50 you spend (in one purchase)!! Good morning! 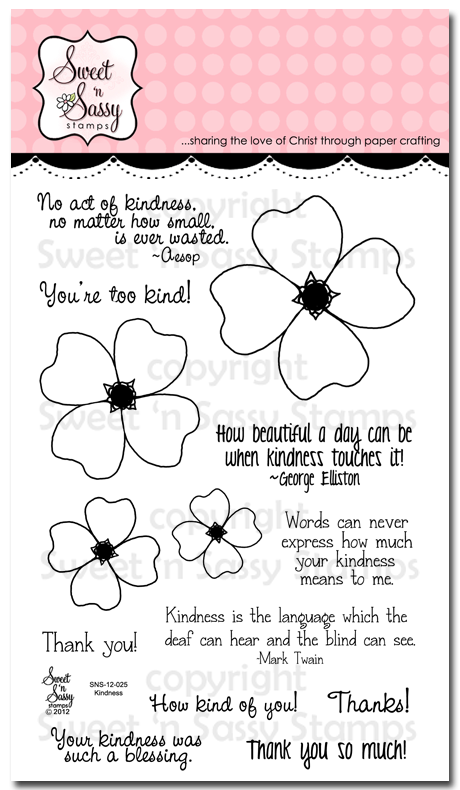 Today I am sharing a CAS set of 3 cards with the Kindness and True Friend stamp sets. 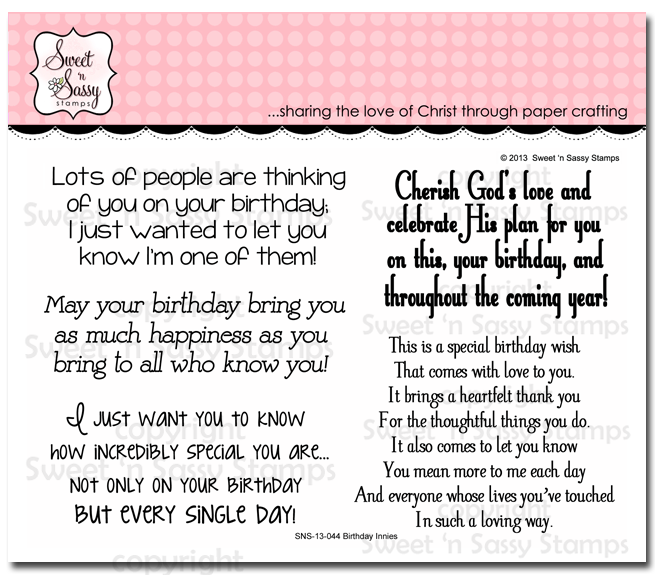 I made this set to honor Korin last week as she celebrated her birthday. 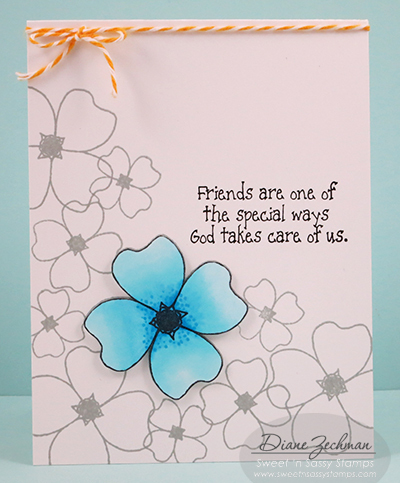 The first card I made was a little softer…I stamped the flowers in the background with gray ink and colored the flower with soft blues. The next two I made a little bolder, stamping with all black. 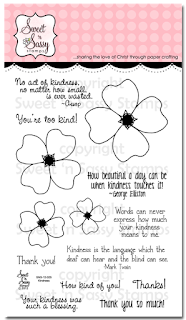 The Kindness stamp set looks beautiful in many colors! Do you have a favorite color? 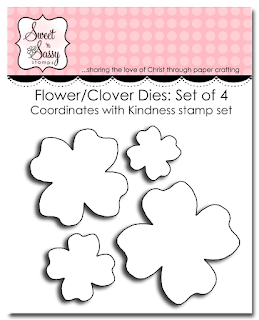 I used Kindness clear stamp set with the coordinating Kindness Flower/Cloves die set. 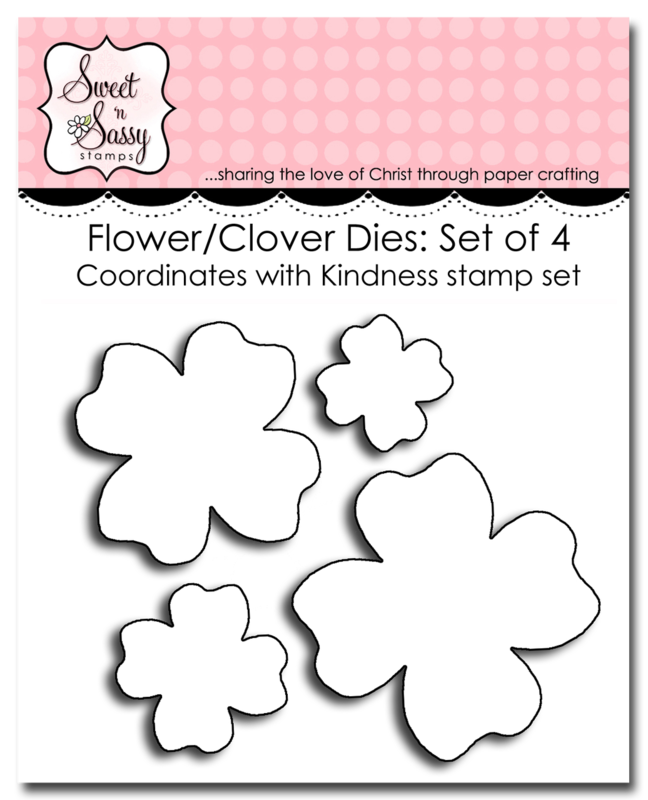 The flowers were stamped on vellum with VersaMark ink, heat embossed with white embossing powder, then die-cut with the coordinating dies. 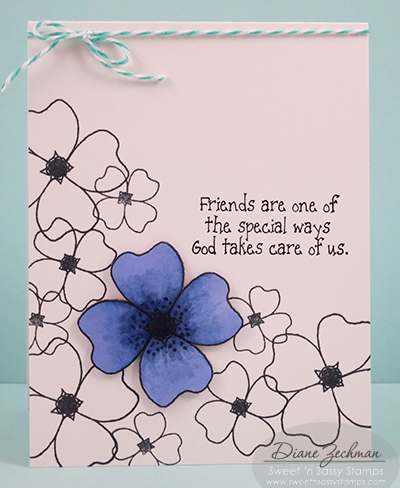 For the background, first I water colored the right side with purple ink, then I stamped one of the flowers from Long Stem Silhouettes clear stamp set with the same color. The greeting came from Birthday Innies clear stamp set. I also used a retired leaf die set for the leaves. 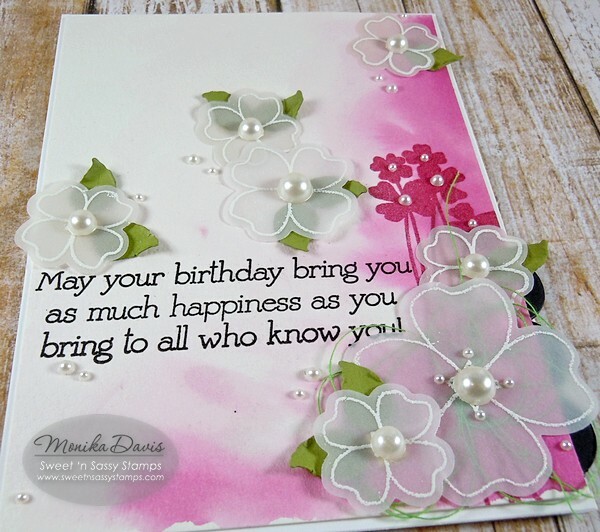 Pearls and green thread finished off the card perfectly.